An annual tradition on this blog is to celebrate Christmas by showing a video of a scary man rugby tackling people with Christmas presents in order to explain the Christmas message. This ain't no sleigh ride baby! Why is Stonewall getting money from the National Lottery? The Sunday Times reports that the National Lottery has awarded just shy of £500,000 to Stonewall, expressly for the purpose of political lobbying (aka 'leadership, media and influencing'). Stonewall has an annual income of over £7m, and reserves of nearly £5m. We've had a grant from the Lottery of £500k too, to help build a community centre for one of the most deprived areas in South Somerset. Our annual income (at St. Peters church Westfield) is about £17-18k, reserves are around £12k. So it would take us a few years to come up with the money ourselves, from a community which doesn't actually have those resources in the first place. One of Stonewall's founders is Sir Ian McKellen, who has an estimated net worth of $55m. The Lottery is already a deeply flawed system for funding public goods. It is predominantly played by those on lower incomes, and the funding itself doesn't go back into the poorer communities who generate most of it. I have serious questions over why a well resourced, well connected group with nearly £5m reserves should get any of this cash at all, when we are surrounded by food banks, homelessness and local support services for children and vulnerable adults closing own left right and centre. I'm grateful to the Lottery: Building Communities team for the £1/2m that Westfield is getting, but the mission creep in other parts of the organisation is serious cause for concern. https://christianity.org.uk/ website with lots of links, topics and things to explore on spiritual questions. https://www.reasonablefaith.org/writings articles by William Lane Craig, who does lots of public debates and discussions on the Christian faith, the evidence for it, and some of the common challenges to it. Lots of videos and other materials on the website. "Walk softly, as you go through Christmas, that each step may bring you down the starlit path, to the manger bed. Talk quietly, as you speak of Christmas that you shall not drown out the glorious song of angels. Kneel reverently as you pause for Christmas, that you may feel again the Spirit of the Nativity, rekindled in your soul. Rise eagerly, after you have trod the Christmas path, that you may serve more fully, the one whose birth we hail." Apparently David Cameron is now advising Teresa May on how to handle the Brexit process. She'll be taking marriage guidance counselling from Boris Johnson next. I hope this is part of a cunning plan by TM to lock him in to No 10 until he's cleaned up the mess he created whilst she goes on extended leave. 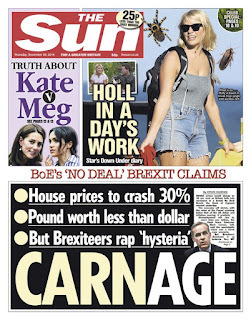 UK note to self: if someone has been a member of an Oxford club which dressed up to the nines, trashed an eating joint, then threw a wad of notes over their shoulders as they left, that might have some bearing on how they will handle politics if you elect them. If you know anyone who is thinking about training in youth work and church leadership then please point them towards this. It's the outline role description for a youth work trainee based in our parish, starting in September 2019. We provide a local placement and accommodation, training is done through South West Youth Ministries, a well established Christian training agency which oversees dozens of placements around the SW every year. Deal or No Deal: Teresa May searches 22 identical red boxes for something that she can sell to her MPs. Every now and again the Junker rings up and offers her nothing. Sounds of the 70s At last UKIP finds a decade which resonates with its values. Featuring old classics such as Making Plans for Nigel, Here's to You Tommy Robinson, and a remix of Money, Money, Money featuring Aaron Banks. DIY SAS under cover of the Brexit chaos, the government sneak out plans for further cuts to the armed forces. Are You Being Served Notice? Revival of the classic comedy set in a department store. For the first week anyway, after that it's set in deserted retail premises in an anonymous town centre. Chocolate Christmas - telling the story through chocolates and sweets. Or just browse the chocolate aisle of your local supermarket and see what names jump off the shelf. and just in case these inspire you, here's a chocolate version of the Easter story. To avoid spending lots of cash, you could use pictures rather than the real thing. But it's quite fun rummaging through for the next item whilst everyone tries to guess what it is. Enjoy. Teresa May can always be consoled this month by the fact that, back in 2005, Coldplay wrote a song about her. This is going to be a pretty niche post, as I guess the Venn Diagram of a) statisticians who are b) interested in Somerset and c) interested in Anglican attendance is not going to have a huge shaded area. Every year Bath and Wells, like all dioceses, collects church membership stats to calculate 'Parish Share' - the contribution each Anglican church makes to overall running costs. The latest set include membership figures from the last 2 years, the amount of Parish Share paid, and the parish 'category' - an indicator of how prosperous (or not) the parish is. Here's what our 484 churches look like, with Bath Abbey (542) to the left, and Greinton (0) to the right, and the rest of us in between. Compared to the CofE as a whole, our churches are a bit smaller on average. If your picture of the average church was of 60-80 people with a Sunday school and a vicar, think again. 50% of churches in Bath and Wells have an average Sunday congregation of 23 or fewer. 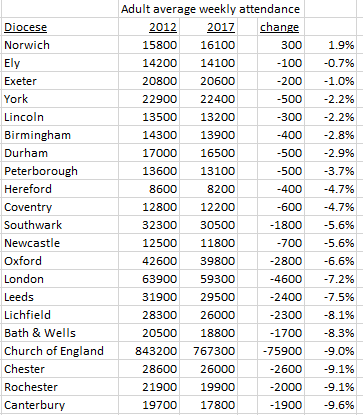 This table collects several bits of data - church size, church growth, Parish Share paid by these churches (an indicator of financial viability) and the number of CofE clergy that equates to (we cost about £50k per year when salary, housing, pension, training etc. costs are all added up. Someone else can blog about whether that's value for money!!). The smallest churches would need to club together in groups of 15 to support 1 vicar, whilst the largest ones pay enough parish share to support 3 clergy per church - in practice, this usually means they are supporting clergy posts elsewhere in the Diocese. Wells Cathedral and Bath Abbey are the only churches in Bath and Wells which get to recruit 3 or more full time vicars. You can see that it's only the larger churches that are doing anything like holding their own - this is just 2 years membership stats, so the smallest ones have lost a pretty steepling (sorry) 13% in 2 years. In passing, of the 7 shrinking churches in the 200+ bracket, 5 have had a vacancy in their senior leadership position during these two years. Church practice usually ensures these vacancies last for at least a year. In small churches the key relationships of the congregation will be with each other (and they may only see the vicar every 3-4 weeks), whilst once you get over 80-90 people, the vicar becomes more of a focal individual. Church members can't know all the other members, but they all know the vicar. So a void in this chair in a larger church could have a bigger effect than in a smaller one. And finally, I had a look at whether churches who paid more or less in Parish Share did any different. Category 'A' are the richest parishes, F, G and s are the poorest. The top category is skewed by having Bath Abbey as one of the two churches - the largest church in the Diocese, and also the one that is growing most strongly (79 new members in 2 years). 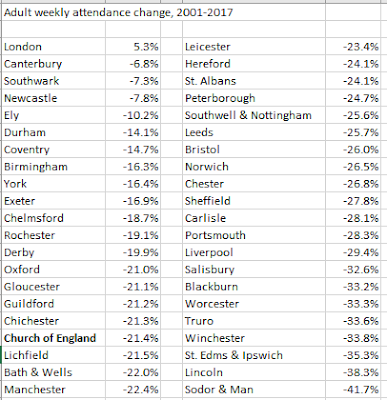 The 2nd fastest growing church is in category G, St. Pauls Weston super Mare, which has added 78, and this rather skews that line of the table - without this church it would see a -3.5% fall in membership. 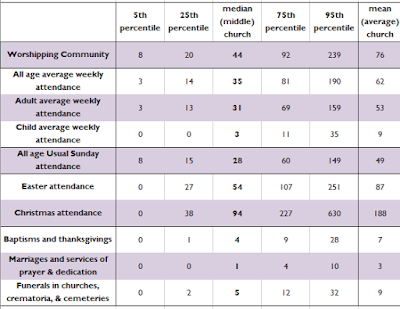 However, there is a significantly higher proportion of churches in the bottom 3 lines growing than in the top 3. Does that mean we're doing better in poorer neighbourhoods, or that churches with a smaller financial burden from the centre have more resources to give to mission and ministry? There are 2 other questions I'm not sure we're asking. One is of the growing churches in each category, to find out what they're doing well so that good practice can be shared. The other is of those which are falling off a cliff - 35 churches lost 1/3 or more of their membership in these 2 years. Some are very small churches, but when a church of 100 loses 30 members in a short space of time, we have to ask if there is any extra support needed, or anything that could be done to catch this sort of thing before it happens. 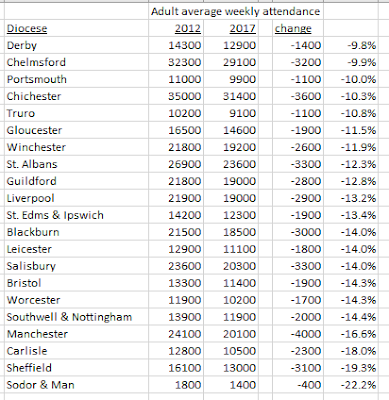 If you're from a different diocese and want to have a play with the figures, email your finance department and ask them for an Excel spreadsheet of the parish membership stats collected for parish share. Ours were very obliging, though they might think better of it now they've seen the results! In the same week as the various apocalyptic forecasts for the future of the UK, it's once again time for the Church of England lectionary (set readings for each Sunday and weekdays) to hit the spot. Which is all standard biblical picture language for 'things are about to get really nasty, nobody will have a clue what is going on, and it will feel like the end of the world'. Within 40 years of Jesus' words the Roman emperor changed 4 times in a year following Nero's suicide, each with their own army. On the radio yesterday someone was sketching out a scenario in Parliament where Teresa May was ousted, her Conservative successor lost a vote of confidence, and Labour won the election. 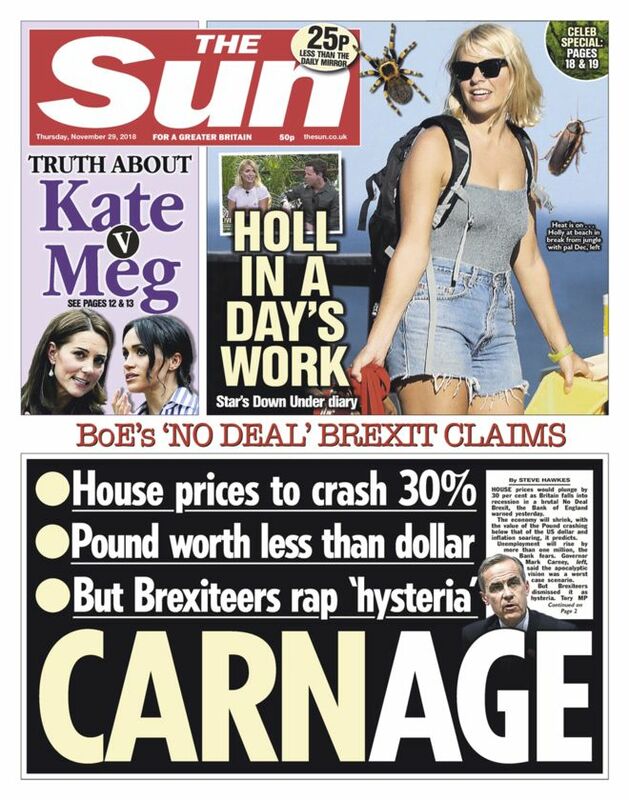 They didn't spell out how Vince Cable would end up Prime Minister at the end of all that but these days, anything's possible. Jesus warning in the light of the Europe-wide convulsions, and their grim impact on his homeland was: Be careful, or your hearts will be weighed down either by indulgence or by anxiety. These have always been the two standard ways we deal with bad news and bad situations to avoid praying: blot it out or fret over it. There is a third way: watch and pray. As if to illustrate, the same passage from Luke concludes with Jesus heading away from Jerusalem to Bethany, the garden of Gethsemane was on the route, and Bethany was Jesus place of retreat and hospitality. It's from the place of prayer that we see clearly. William Wilberforce credits the practice of Sabbath with keeping him focused and persevering on his great work. "Blessed be God for the day of rest and religious occupations wherein earthly things assume their true size and ambition is stunted…" I wonder if there's a connection between the Prime Ministers remarkable resilience and her regular Sunday worship. Can any politician lead well if they are in the swirl of events 24/7/365? Luther: in an updated version of the 500 year old tale, a disgruntled millenial pins 95 Christmas present requests on his Facebook profile, and causes a Europe-wide revolution when he doesn't get what he wants. Originally billed to star David Cameron but nobody's seen him for months. Doctor Where? Live coverage of an A&E department on Boxing Day. There's a New Year special too, where the Doctor scours the globe from India, to the Philippines, to most of Africa, trying to find treatment for her sick companions, only to discover that all the trained health workers have left to work for the NHS. Mrs Browns Buoys. Panorama special following the irascible crew of a border crossing in the middle of the Irish Sea. May run until late 2020. Or longer, much longer. Waterstones Shop Down. Amazons besiege the last remaining high street shop, in a rural town somewhere in the Midlands. A host of celebrity cast members realise that ghostwritten biographies are are too insubstantial to defend themselves against the incessant volley of attack, most of it aimed at the address next door but they called and nobody was in. Where in the shop is there a book substantial enough to save them? The Mash Report. Stocktake at the local food bank. Starring roughly 160,000 households. The Queens Christmas Massage. By special dispensation, delivered this year by Tyson Fury. To Donald Trump. Match of the Day: Special Edition. Which footballer can match their salary to how much they are actually worth? I'm a Celebrity Get Me Out of Here! No. 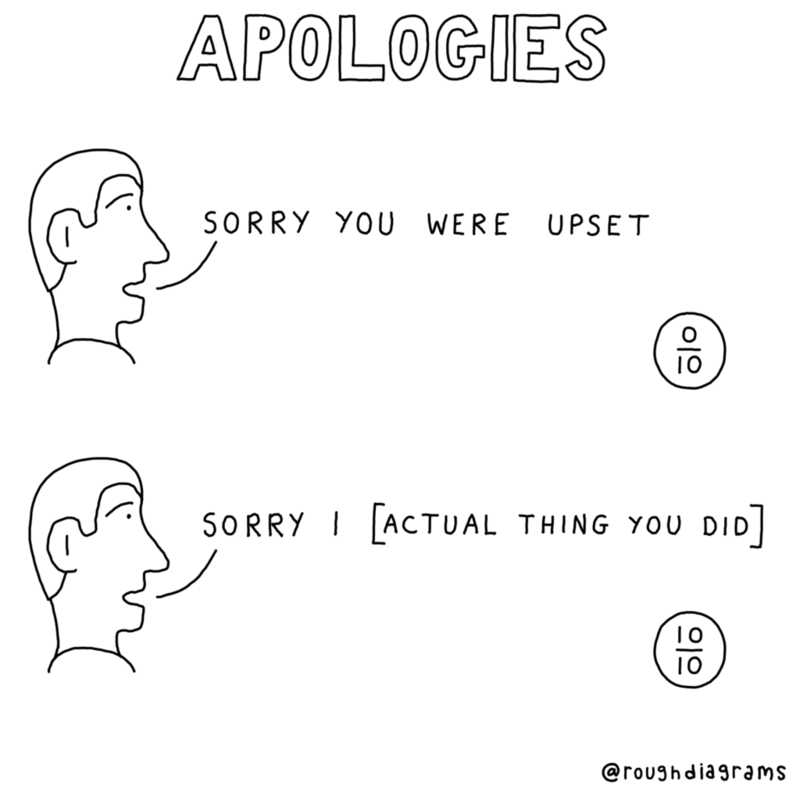 The most excellent Dave Walker has a new blog, Rough Diagrams. It even has some very natty T-shirts which you can order in time to make a Christmas gift. Not as much stuff up there as the remarkable Cartoon Church, but well worth a look. A British citizen has just been sentenced to life imprisonment in the UAE after a 4 minute trial in a language he doesn't speak. He was drugged and kept in solitary confinement during his 6 months imprisonment before the 'trial'. Pakistan kills people for 'blasphemy' (65 since 1990) and there are riots whenever mercy is shown, the Saudis chop people up and pretend to be innocent, the UAE tortures people and denies them a fair trial. Then there's Syria, Iran, and the majority of this lot. Are Muslim majority states just having a bad run of publicity or is there something more fundamental going on? Or is this just absolute power corrupting absolutely (cf China, Putin's hit squads, N Korea)? The press briefings clearly did their job, pushing Christmas attendance and digital engagement to the top of the page and relegating the gnarly stuff about attendance to further down. The report itself starts upbeat, focusing on a new measure 'Worshipping Community' which also happens to give the highest figure for church participation of 1.14m. There are also encouraging figures on church 'joiners', with 83,000 adults joining an Anglican church in 2017. Of those, 31% had never attended church before, and 17% had previously left and were returning. That's good, and encouraging. read down a page or two and you discover that the Worshipping Community measure doesn't offer 'robust information' and keeping track of it is 'more challenging' than the traditional headcount. - The dioceses which have done 'best' are mostly rural, with an East coast strip from the Thames to the Humber seeing slower decline than the rest of us. Do UKIP members go to church more regularly? - Other than that its a fairly dire picture: after some indications that decline in CofE membership was slowing down a few years ago. With now 10% of children being baptised, 19% of marriages and 26% of funerals being hosted/led by the church, each successive generation is less and less engaged with what the CofE is offering, outside of Christmas. Under Rowan Williams and even more so under Justin Welby, the CofE has more and more started to reckon with these figures, rather than ignore them (though the tone of the report and the press release seems designed to cloak the truth rather than face it). We will know in a few years whether the growth of fresh expressions, mission strategies and evangelism resources has made any significant difference. My own Diocese, Bath and Wells, is now focused on 'putting mission and evangelism at the heart of all we do'. I can't fault the stated direction, and its a massive and welcome change from recent history, but the jury is out on the execution. We've successfully applied for central funding for an extra 10 posts to take forward church planting and pioneer ministry, and at the same time a quick glance at the Diocesan budget shows an increased headcount of 10 full time posts in the Diocesan staff. Some of this is to strengthen the safeguarding, vocations, and mission advisory teams, but I do question the ratio, and wonder what 20 extra parish-level staff would do for mission and growth at a local level, if invested wisely. - 75% of Anglican churches have 60 people or fewer on an average Sunday. - Of the 16000 churches in the CofE, around 4000 have 15 or less on a Sunday, 1 baptism a year and no weddings and for their big services have enough to fill a decent sized pub function room. None of these churches needs to seat more than 50-70 people. I'm sure every one of these buildings is loved and treasured, but we are way past the point where this is sustainable. Do we have a strategy for closing or re-using buildings, before the inevitable collapse in the system? 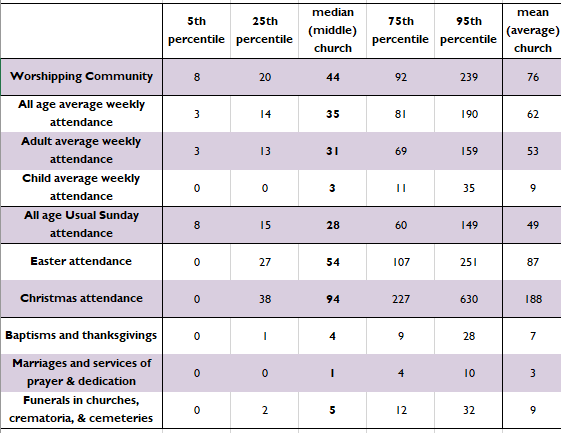 - The bigger churches have a proportionally bigger 'fringe' - churches on the 25th percentile see 2.5x their usual congregation turn up at Christmas, those on the 75th see 3.75x their usual number, and it's higher still for the biggest. - Some very different leadership is required for the churches on the left hand side of this table to those on the right. What are we training people for? - It would be interesting to see the parishes mapped on to these by growth/decline, sometimes the biggest decline comes in the biggest churches. In my own Diocese, there are 76 churches with a membership in single figures, only a handful have reported a rise in membership in recent years. All have a building, and required to have church wardens, treasurer, safeguarding officer etc. At the other end of the scale there are 11 churches with over 200 members, 5 of these have grown in the last 3 years, (and at least one of the 'shrinkers' has had a vacancy) which for the CofE is almost impressive. Here, as in every Diocese, the Diocesan leadership needs to get behind those growing churches and make sure they are supported and resourced. It also needs to shorten vacancies in large and already thriving churches. Sorry to be the bearer of bad news. This isn't an argument for giving up all this new fangled mission stuff and go back to the good old days. The new fangled mission stuff is about 2000 years old, and the good old days were days of decline anyway. The CofE is planting new churches, it is seeing more people called into leadeship, it is discovering new ways to share the gospel and make disciples. But we are saddled with models and structures of ministry which act like lead boots on the feet of the messenger, and I also fear that many of those who are seeking to lead the church into growth don't have that much experience of leading growing churches themselves. Maybe like Jacob God needs to wrestle us to a point of weakness, so we can limp across the river, stripped of the things we used to depend on, and discover renewal on the other side. The stats are also available in an Excel file, which puts an end to the years of transcribing them line by line out of pdfs into a spreadsheet, so a big thankyou to @cofestats for doing that. Here's my analysis of last years stats, which provoked quite a debate, and remains the most visited page on this blog by some distance. 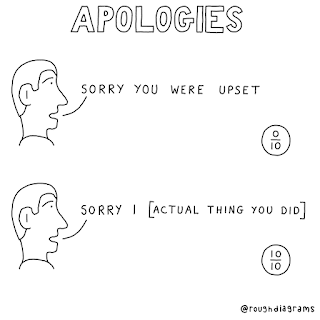 By the way, I'm not on Twitter so if you think this needs a wider audience, dear reader, then tweet away. Update: this was posted on my FB feed, a quote from a Diocesan bishop in the S of England "If as the figures might suggest the Church of England is dying, we in this part of the country are determined to die a spectacular operatic death while investing in evangelism and church planting, not a whimpering unobtrusive death behind curtains in a hospital, meanly hoarding our resources so that we.can pass on our silver to somebody else's grandchildren". There is a welter of statistics - on a skim read it looks like a report keenly searching to find one way of measuring things that doesn't look quite so bad as the rest. Outside the East Anglian dioceses, membership is dropping off everywhere, and more quickly among children. The number of baptisms, weddings and funerals done by the church has dropped by 25%, 22% and 16% respectively in just 5 years. If you want to know more, pop back next week, but pour yourself a stiff drink first. At 9am today you can start voting for the New Westfield Community Centre in Yeovil to get £10,000 of funding from Aviva. Use this link, every person gets 10 votes, and if you can use them all for our project then that would be brilliant, thankyou! Have a look at this video if you want to know what we're doing, or just read the blurb on the Aviva site. We've raised £820,000 towards a £920,000 target, the Aviva funds will give us the money we need to kit the Community Centre out with kitchen, seating, pop up library and toys etc., so that it can be used by 5,000 local people in Yeovil, and help bring hope, life, fun and support to a whole community. We reckon we'll need over 5000 votes to be in with a chance, which means over 500 people voting for us. Please be one of them! Here's a little project I've been involved in for the last 3-4 years. It doesn't completely explain the absence of regular blogging since 2016, but its my best excuse for the moment. It's made for a Gift Day this Sunday, and hopefully by the time you watch this, the funding summary will already be out of date. Or if you're really feeling inspired, give online here.